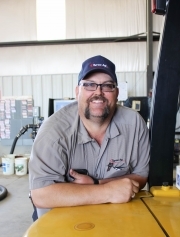 JimBob has been an employee for Tyree Ag since 2007. He is a Kinsley native and currently lives east of Kinsley with his wife, Jeannine, and daughter Ellie. Two other sons include Levi and Dakota who are both married. Before his current position, JimBob worked in maintenance for Cross Manufacturing, Star Alfalfa, and also farmed before becoming a maintenance specialist and product transportation employee for Tyree Ag.